The focus 77 is described by most photographers as a beauty reflector. Due to its distinct depth, pictures receive a modulated touch, and the depth of the shadow is extremely variable. Compared to the focus 44, the light of the focus 77 is much “softer” and ensures ultra-smooth harmonic progressions. Due to its soft reflective reflector-coatings, it covers up some errors in the make-up and smoothes out wrinkles, without appearing flat. 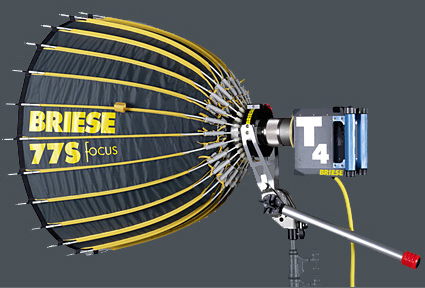 That makes the focus 77 one of the most popular beauty and close up-lights in photographic and film studios worldwide. The Focus 77 is compatible with the H2 (2K Tungsten) lamp head, as well as the 1.2K (HMI) T4 lamp head. Available Light includes a Full and 1/4 diffusion with the Focus 77, along with all the other necessary accessories. We also offer an optional 1/2 diffusion, as well as 30 and 50 degree fabric grids.